"Family favorite. 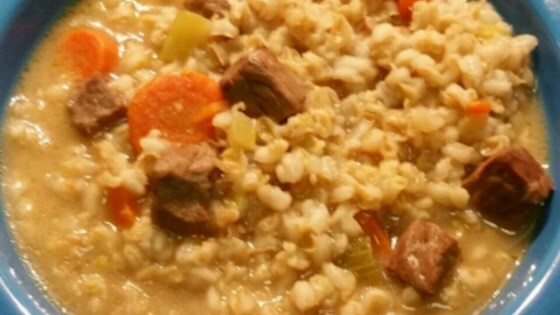 It kind of turns into a type of stew as the barley soaks up much of the beef stock. Best part is that it gets better with age, so make plenty and enjoy throughout the week! It's always better the second day, so you might want to cook it one day, refrigerate it overnight, and then cook it again the next day." Cook beef stew meat in a large skillet over medium heat until completely browned, 5 to 7 minutes; transfer to a large soup pot. Heat vegetable oil in the same skillet over medium heat; cook and stir onion, celery, and carrot in the hot oil until the onions are tender, about 5 minutes. Add the vegetable mixture to the beef in the pot. Stir pearl barley into the stock. Place soup over medium-low heat, bring to a simmer, and cook, stirring occasionally, until the beef is completely tender, about 2 hours. Stir mushrooms through the soup; cook 1 hour more. I didn't have mushrooms so left them out. But otherwise flavor was great! It didn't take 3 hours to cook...I cooked barley only 1 hour and it was definitely enough time for the whole soup. Loved, loved, loved!!! Awesome recipe! Delicious and filling. I have had many requests for the recipe!! Highly recommend! !